What to do with Doug O’Neill and his most recent drug positive in New York that resulted in a 45-day suspension for the Southern California-based trainer and a ban from participating in the Breeders’ Cup World Championships? Oxazepam is in the same drug family as diazepam, or Valium, which is a muscle relaxant. According to the New York State Gaming Commission, the drug was administered within a week of the horse’s race June 2, 2013, which is a violation of state regulation. Though O’Neill has already accepted his suspension, his problems don’t stop in New York. O’Neill got a lot of unwanted publicity during the 2012 Triple Crown when his stable’s star I’ll Have Another had a bead on the Triple Crown title until injury sidelined him the day before the Belmont Stakes (gr. I). During a high point of his career, the trainer also got cited for a total carbon dioxide violation in a filly named Argenta when she raced at Del Mar Aug. 25, 2010. Total carbon dioxide (TCO2) in the blood is what is monitored to identify cases of “milkshaking,” or tubing a horse with a bicarbonate of soda mixture that lowers the build up of lactic acid in the muscles and reduces fatigue. TCO2 levels can also be influenced by an overage of the anti-bleeder medication furosemide (Salix). Eventually, a California hearing officer concluded that O’Neill had not milkshaked Argenta but he still had a TCO2 test that exceeded the regulatory limit of 37 millimoles/liter. Under the trainer insurer rule, O’Neill was suspended for 45 days with an additional 135 days stayed, provided O’Neill committed no other Class 1, Class 2, or Class 3 violations within 18 months of July 1, 2012, when his suspension began. The oxazepam positive occurred less than a year later. Quite a bit is riding on O’Neill’s case and what actions the California Horse Racing Board will take. O’Neill has a trail of 19 medication violations going back to 2005, most of them involving overages of therapeutic medications—dantrolene (muscle relaxer), dexamethasone (corticosteroid), flunixin and phenylbutazone (both anti-inflammatory drugs). He’s also had two other TCO2 violations and another for anabolic steroid use. The oxazepam positive could provide California with its own Rick Dutrow Jr. moment to make a statement. A positive for the painkiller butorphanol in Dutrow’s runner Fastus Cactus and the discovery of hypodermic needles in a Dutrow barn resulted in the New York-based trainer getting a 10-year ban from racing that began three years ago. Dutrow had had dozens of prior run-ins with regulators, and the New York Racing and Wagering Board decided to make a statement. In such a climate O’Neill may accept the oxazepam suspension but fight the positive test, as he did with the TCO2 case involving Argenta. O’Neill noted in a statement on his website that Wind of Bosphorus had been moved to three different stalls over 10 days prior to his race June 2, 2013, at Belmont Park. He also has been told that diazepam is commonly given to horses that get castrated and it is possible one of these stalls had been contaminated with the drug. 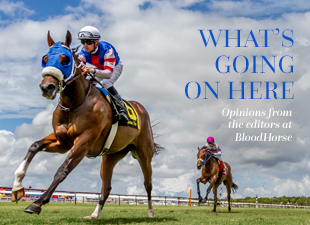 In addition to suggesting the contamination, O’Neill has posted an opinion questioning the validity of the drug test from Dr. Steven Barker, director of Equine Medication Surveillance Laboratory, which is the official testing lab for the Louisiana State Racing Commission. Barker’s opinion raises five questions about the accuracy of the blood work analysis. He had requested a sample of the blood to test as well, and received a sample insufficiently small to test accurately (less than half a milliliter). “Given that there was no opportunity to retest the blood and because the data presented by the Commission’s laboratory regarding the blood cannot and should not be considered evidence, it is my opinion that any discussion of the presence of oxazepam in the blood sample of the horse in question is legally and scientifically unfounded,” Barker wrote. If New York comes back with a definitive, defensible test result for the oxazepam positive, then California has no choice but to move swiftly with the full 135 days and perhaps set a harsher penalty—a one-year ban—if another positive occurs within a year. Anything short of this only reinforces the widely held belief that racing doesn’t take medication violations seriously enough and is not capable of policing itself.